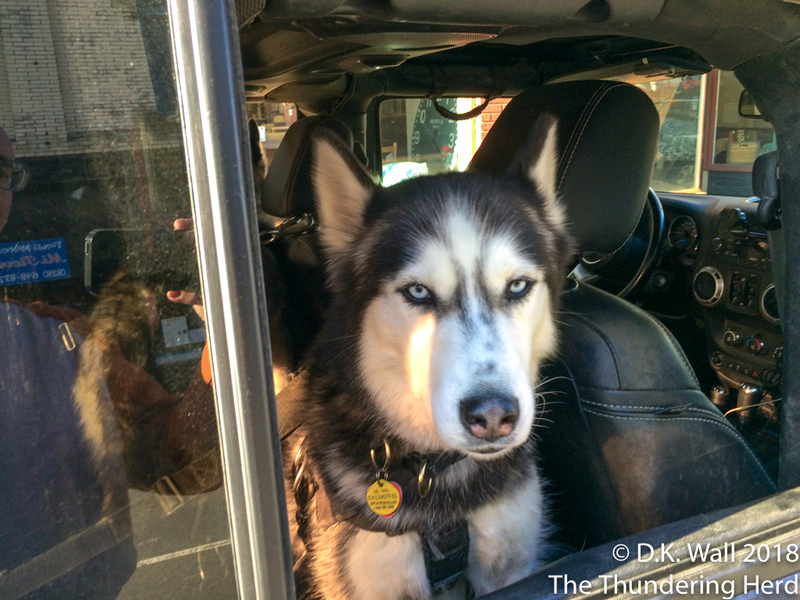 A beautiful, cold Saturday, so we went for a ride in the Jeep. Little did we know that the Hu-Dad would have sitting at the curb waiting. Why are we at the curb waiting? What a glorious, cold day. We woke to a skiff of snow on the ground and the ski area next door making snow full tilt (they are opening Sunday). 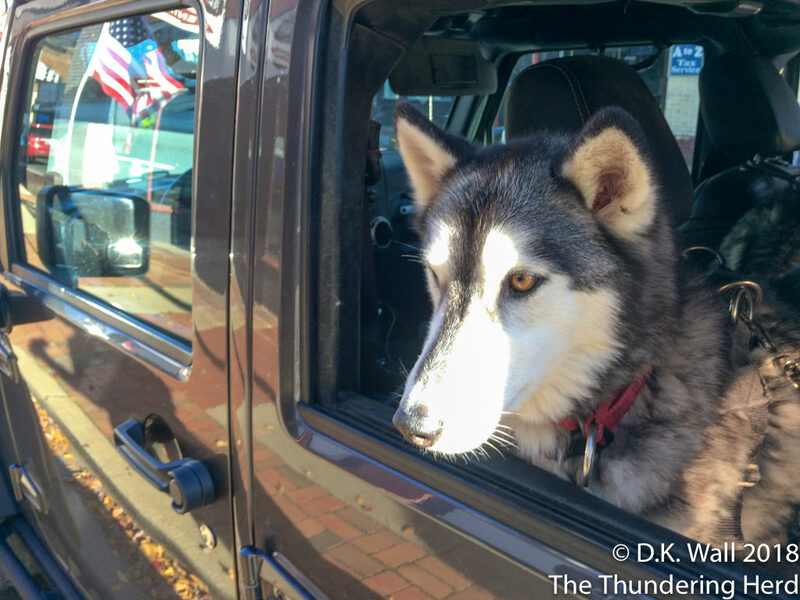 Hu-Dad suggested we jump in the Jeep and take off for a day of fun. So why were we sitting in the Jeep downtown while he ran some errands? This isn’t as fun as advertised. Oh, sure, Hu-Dad will probably point out that he took us to the park and we took a long walk in the cold air. We met lots of other people and dogs and had lots of fun. But ignore all of that and just feel sympathy that he made us wait in the Jeep while he ran a quick errand. P.S. – A salute to all of the Veterans out there. We really appreciate the sacrifices you made and just want to say – Thank you. OH POOR POOR Chez Herd-Hu-Dad leaving you in the Jeep while he ran errands. Oh yeah-I forgot you said to leave out the LONG walk in the park and the people you met along the way!! To all the Veterans out there(including my Dad in Heaven) thank you for your service. 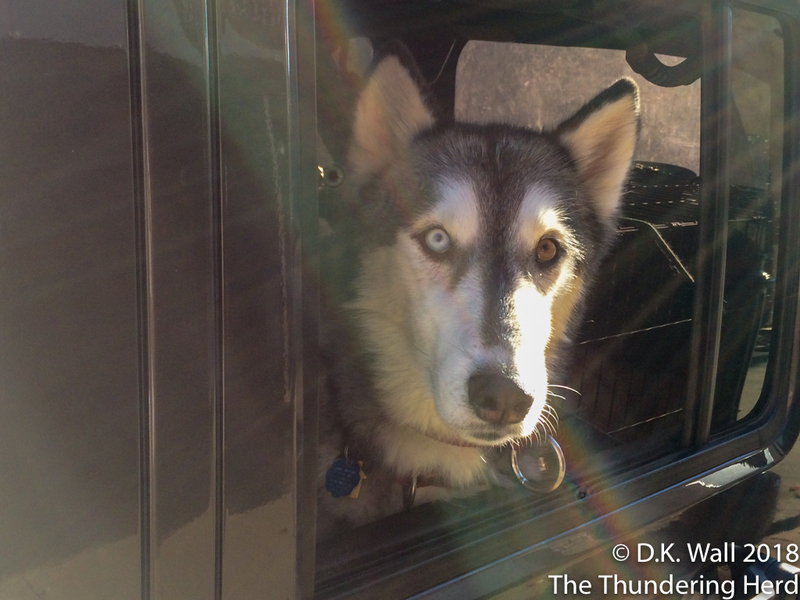 My dog Cherokee said when she passed on (we used an animal communicator regularly with her) that she hated the waiting the most (when we would run errands too). She wanted to be inside with us doing what we did. Like you, we always tied in something or two for the dogs (if nothing else letting them get out at every stop to sniff). And now where we live, a lot of places let you bring in your well behaved dogs (the dogs we have now are not well behaved in public with other dogs so we don’t chose to stress them out). Love the pics. Thank you to all the veterans including my retired husband and our son, our uncles, our deceased Grandfathers. Well I never!!! Complete false advertising on the part of the hu-dad… you poor poor herd! Really, Hu-dad misrepresenting a ride for a park? Do we need a formal dogument about this?